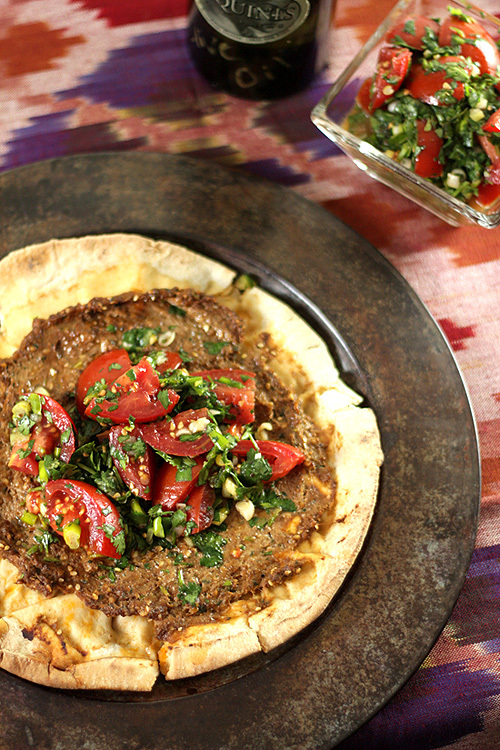 This was a huge leap of faith and I’m so glad I took it; the combination of ingredients and the presentation of this Ground Beef Sfeeha on Pita both made for a superb dish. Well, after quite a journey, that’s how! Believe it or not, it all started with my contribution to the Peko Peko Charity Cookbook. I was asked to contribute a dish, something simple that most of us could actually make for our families and I had recently seen something I thought perfect; some Sweet Potato French Fries that were seasoned with Furikake. FuriWhatkee was my first thought. But my friend Rachael, the infamous LaFujimama said I could find some at an Asian market. I was on Google within moments and discovered an H Mart was within 15 minutes of my home and I was on my way! Fast forward 2 months. In the interim I’ve been to the H Mart a couple of times. A second time where I discovered that the pork belly I had looked EVERYWHERE for in order to make Maple Bourbon Bacon was readily available and in a variety of cuts! Then again last weekend after a meeting of Front Range Food Bloggers at my home. We pulled the arm of Andrea (ever so slightly I might add) with Fork Fingers Chopsticks and were soon off. Yes, we bought more pork belly and other assorted goodies and then, as we were leaving, someone wondered if we wanted to also visit the Arash International Market directly across the street. Of course we did! What a find! 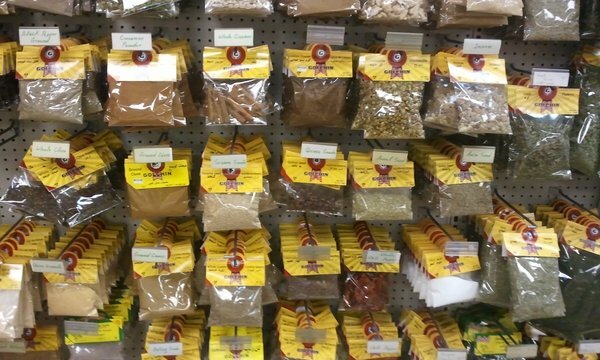 Spices galore only previously located at specialty spice stores. Sumac which I have previously only used for a favorite olive oil dipping sauce, Pomegranate Molasses which I had only seen before at a local spice shop at a ridiculously high price, some fabulous pita bread and some Tahini, which is basically ground sesame seeds and a necessary part of hummus which I wanted to try making. Beyond the fresh plums and the dried fruit mix I also bought, I mostly did a lot of meandering around to check things out. So many wonderful new things to try that I knew would help to expand my repertoire of dishes I had previously avoided, assuming they would simply take too much time in the search for their unique ingredients. I was excited; this was a mere 10 minutes from my home!! One of the things I had noticed in the butcher case was goat, available either as whole goat legs or cut in cubes for stew meat (or I am now thinking, kabobs?!!). I had never seen goat offered anywhere, never, ever, so although I did not buy any, it made an impression. It was fortuitous that a day or two later, I saw the blogger behind Kayln’s Kitchen tout a blog she had found and loved called Taste of Beirut. I went to check it out and lo and behold, the first dish I saw required in addition to ground beef – pomegranate molasses, tahini, sumac and pita bread. Didn’t it seem that fate was calling me to make this dish? So I did! I have to admit…grinding up ground beef in my processor to make a paste…that alone was unique. I imagined that 7 spice was simply Chinese 5 spice with a couple more spices (wrong!). And I didn’t have yogurt cheese but had some queso cheese that Andrea had left behind from our blogger meeting. Why not? Mild and firm, I imagined it would be fine. And it was. Simple, yes. Delicious? That too. So delicious that I’m having it again this week when I’ve got some friends dropping by. Wish me luck…this time it’s going on the grill! What’s with the Goat Tripping? I’m going to share the recipe for Ground Beef Sfeeha on Pita, I promise, but first what does this all have to do with goat? Well, I mentioned on Twitter a couple of days later about my trip to the market and that I had seen goat meat for the first time. Who should be the first person to tweet back and tell me goat meat is delicious? Well, my friend Rachael; her of all things Japanese so that was unexpected. And then someone else got in on how good it was. And someone else and before days end, Rachael and I decided to do a ‘Goat Challenge’ which we’re calling ‘Goaterie’ – a name coined by a group of goat enthusiasts on Twitter; a play on the word ‘coterie.’ We are challenging anyone who wants to join us to try something from the goat. For me it will be to cook goat meat for the first time. For others, it might mean a dish which incorporates goat cheese or goat milk. In the July 2011 issue of Bon Appetit magazine, the subject of goat is brought up in a question sent in by a reader and the answer includes a mention of a book just published in April, called Goat: Meat, Milk, Cheese by Bruce Weinstein and Mark Scarbrough and says that “If in five years we’re all eating goat burgers and goat chili, it’ll be because of this book.” Jacqueline Church (@LDGourmet) has some interesting information in an article she did for Nourish Network about Old World meats including goat. It’s a very sustainable meat that is eaten by over 60% of the world’s population. Not as widely available as other red meats, goat meat is becoming more and more well known. Let’s further that cause. Join Us! We’ll be hosting two Twitter Chats where we can discuss and learn from each other and our knowledgeable panelists, including Mark Scarbrough, Jacqueline Church and Rachel Riggs, the proprietor of TheFromagette. The first chat will be on Wednesday, July 13th, 2011 at 9pm EST. We’ll be learning about various aspects of the goat farming industry, tips and tricks for cooking with goat products, helping inspire you to think of ways to cook with goat, etc! The second chat will be on Monday, August 1st, 2011 at 9pm EST. We’ll be sharing our experiences, talking about the things we’ve learned, etc. 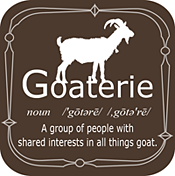 Make sure you follow the hashtag #goaterie for both events and throughout the month for ongoing goat discussion. So really, goat tripping? Well, I’ve discovered in this new quest that a herd of goats is called a ‘Trip’ so look for Rachael and I to find multiple ways to promote this event by totally mangling a combination of goat and trip as often as possible! Cypress Grove Chevre who will provide a goat cheese gift. ManPans who have generously contributed a 10″ Saute Pan. Two prizes for two different participants, the books HAM: An Obsession with the Hindquarter and GOAT: Meat, Milk, Cheese, from one of our resident experts, Mark Scarbrough, and his publisher. Meyenberg Goat Milk Products will donate a sampler of gourmet specialty products that include European Style Goat Butter, Valley Goat Cheddar, “Beyond Traditional” Creme de Chevre and Galic & Chive Creme de Chevre. We would LOVE it if you would include the ‘Goaterie’ badge on your site with a link to this post in hopes that we can get more folks involved. Love it but not required! Publish your post(s) throughout the month of July; all posts using goat qualify; meat, cheese and milk. Multiple posts equate to multiple entries for prizes. After you post each dish, add your link to the InLinkz Tool at the end of this post; include the name of the dish and in the field for a URL; be sure to include the permalink address to your post, not just a link to the home page of your blog. You only need to include it on one of our blogs, it will display on both this one and Rachael’s. It’s most important that you remember to include your post in the InLinkz Tool. Not only does that give everyone a chance to see what others are making, but it will let us know who has participated in the challenge (we need that to award prizes). The contest links close midnight Eastern time, 8/1/11. We’ll select prize winners on 8/2/11 using random.org. Anyone can participate but prizes are limited to US residents only. It’s all about the goat. Meat, cheese or milk. We’re tripping! And finally, as promised…THE recipe! Adapted from A Taste of Beirut – and not very much I might add…this was new territory and I’m not going to stray too far off course until I get a better feel for how much leeway I have! Well I am late to this game but I tried goat for the first time several months back–ordered a shoulder from Grant Family Farms and did a slow braise. It was fantastic. I am totally onboard with introducing more Americans to goat! My first attempt at goat meat started today. My own BBQ of sorts. Meat in mixture of tomatoes, peppers, spices for BBQ sandwiches. Just had my first bite; which was a strange, ‘go on, just do it moment’ and was so happy how good it was. Needs to braise longer but taste is terrific. Whew! I added my goat cheese fro yo, with a little homemade granola on top. I love goat cheese, I could scream it form a roof top, I love it so much. Me too Julia…and I love your fro yo. Yo…making some tonight or tomorrow! Just added my Banana Blueberry milkshakes with goats milk…love this event! Barb, this is an incredible dish and I love you venturing out. Looks super authentic my friend. Hiow to get a post in the nick of time soon. I LOVE the idea of goaterie. Can I submit posts I have all ready published?? Have never cooked goat meat, but I am now very tempted to. Hey Barb. I love the goat theme. On the Mexican culinary front, all things goat are good – think cabrito (slow roasted), cajeta (goat-milk based caramel), cotija cheese. Now that this is Goaterie is going on, I’ll have to rethink my post schedule. The sfeeha looks divine. It was a great day at the market. Well now I expect you to rethink that schedule…it wouldn’t be the same without you! And it would be full circle too; you were there when I saw the goat meat. Can’t wait. Thank you for sharing your link about goaterie! I love love goat cheese, but have not had goats milk yet…always wanted to try though! So I say I am in! Glad to have you join us Terra! Wow – what an interesting recipe Barb! I haven’t been on twitter much lately so missed all the goaterie talk. Thanks for asking me to submit the pasta; now I see all these cool recipes to check out! Fun, huh? I can’t wait either…goat is up for me next. OMG. I seriously love goats. I always tell my friends that I can’t wait until I have a house with a big yard so I can have goats! (and chickens… and a garden… dream big!) I will definitely be participating in this especially since I also adore Cypress Grove cheeses. I will definitely be on for the tweet chat too! I don’t know if I could raise one for meat but sure would be fun to have a ready source for goat cheese. Glad you’re joining us! It worked perfectly and I just LOVE what you did Olga; thanks for participating! I loved seeing your name in the list of contributors for the Peko Peko cookbook 🙂 just added the badge to my blog, writing my first goaterie post right now! That contribution was momentous in a good way. Made me get to Korean market where I now go at least every two weeks. Across the street was the International market with the ingredients for this dish and the goat. I loved contributing to such a worthy cause and I’ve received so much back from that small effort. I LOVED it Rebecca. I mean it sounded good and all but it was the uniqueness that drew me in but I admit, with some trepidation…I mean meat paste? But it was flat out deliciousness! ahahhaha goat tripping, only you Barb with your whimsy!! I am in just told you!! Looking forward to all the posts and excitment involved!! Gotta have fun with the goat, right? Glad you’re joining us! Can you tell I LOVE goat? i just discovered goat a few months ago when I was trying to make merguez and my farmer’s market didn’t have lamb and talked me into the goat. i’m looking forward to this-i already have my goat belly on order for next week. can’t wait to hear other goaterie-ers cooking tips and techniques! thanks for doing this! and BTW, cypress humboldt fog is my favorite cheese! I can; can’t wait to see what you do new with it! whew, Barb- that’s a lot o info in one post! I am pretty sure I followed it all, this sfeeha of which you speak is new to me. I linked up to the goaterie. Viva la capra. The sfeeha was so good…I’m just sure you could put an experimental twist to it. But it’s basically ground beef and spices made into a paste; seemed weird but turned out wonderful. So wonderful that an unplanned trip to an unknown (by you) market would result in this new blogging community venture of Goat Tripping with Goaterie! I have a feeling it will take off like Charcutepalooza did. Good luck with it and have fun! Looking forward to the posts. Really, who knew? The find of that market was bonus enough but now I’m very excited to see what everyone does. You should join us…it’s not about the prizes, it’s about the adventure! Hi Barb! I read this yesterday as soon as I got it on email and am looping back to comment. I’m very intrigued by this. First loved your recipe and photos. So warm and exotic! Really want to visit H Mart after Karen’s report earlier this year. Love poking around places like that. Also in the U.S. I tihnk we don’t realize how popular goat meat is in other parts of the world since it is not in our top most popular meats here. Of course I’m curious about a clean source for it too. Since I know the farmers and conditions for all my meat, I’ll be a bit twitchy on the goat front until id’ing a good source. Will be closely watching your exploits to learn more! Kudos for venturing out of the culinary mainstream and educating on this! Because of Islamic law surrounding the preparation of their meats, I feel very comfortable purchasing goat from the local ethnic market. However, I am looking into a local source and considering a field trip! The location on Parker Rd where both H Mart and Arash are located has other markets nearby…it’s sort of become ‘ethnic market row.’ I hadn’t been to that part of Aurora for years but now it seems I’m making a weekly trip. Not just for the unique either; their prices on some things can not be beat. French feta cheese, jars of sour cherries and the biggest and best stem of dill I’ve ever found in a grocery! I’ll have to look into getting some goat for Eric. Thank you for sharing this dish with all of us! It looks wonderful! It was wonderful and now you’ve got me thinking…what would I do if I were a Pescetarian? 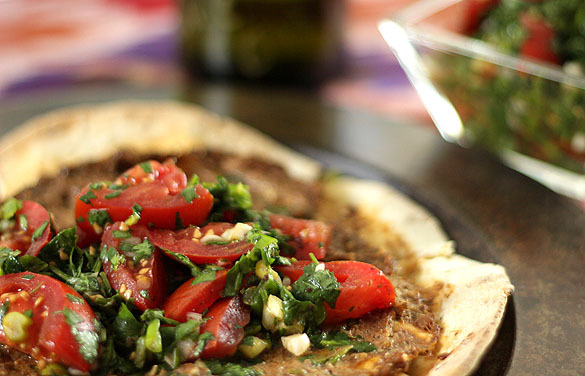 Maybe tabbouleh or quinoa with the same spices heated on the flatbread and topped with the salad. Bet that would be great too. You can also do a dish with goat cheese or milk too…so even non meat eaters can join in! Goat farming is growing here in Ireland too. I have a few foodie friends that raise goats for the milk and cheese (yum) and we can buy goat meat locally from our famers market. Very interesting post and the recipe / spices are so tempting! Is that Sfeeha something you could make with goat in place of beef? Ok, gonna hit the middle eastern market and see if I can find goat meat!! This sounds like way too much fun to miss!! Yay…glad to have you onboard. If there is a middle eastern market, well, they just have to have goat!! Taste of Beirut is an awesome blog . Goatmeat has always been a favorite growing up due to to the African and West Indian influences around me. It really is a tasty meat. Well, I hope you make something and join our challenge…although maybe this isn’t really a challenge for you! Thanks Alan…now want to get some ground goat and try it! So glad you’re joining us! Wow, what a market. And how fun seeing how your version of the dish turned out. I’m beyond excited about discovering it…opens up the doors to a lot of new things I’ve previously only eaten at restaurants. I’m very excited about joining the Goaterie! I hope I’ll have time to explore meat, milk, AND cheese during the month. Thanks to you and Rachael for putting this together. And I’m excited you’re excited! Can’t wait to see what everyone does with all things goat! Glad you gave this a try and loved it; as you become more familiar with the use of middle-eastern ingredients, you will be using them in all kinds of familiar dishes; I thought I had provided a link on how to make labneh; basically, you take some plain yogurt (whole-milk if possible) and pour into a sieve lined with a coffee filter or paper towels; let the yogurt drain overnight, covered loosely with plastic in the fridge. The next day, you have labneh; add a touch of salt and drizzle some olive oil and this is our typical lebanese breakfast cheese eaten with bits of pita bread and some diced tomatoes. I have published a few recipes using goat cheese and would like to be a part of this event. I did love it…and this week I really am going to try it on the grill; heating up one side and then cooking the sfeeha on the other side. Thanks so much for the additional information; I’m modifying my post to include your directions. I have yogurt in the fridge all the time but even if I had…would have probably used the queso since I didn’t want to wait another day! So glad you’re joining us in the event…it should be fun and a great learning exercise. Labne is something we have here in Turkey. It is pretty close to sour cream and cream cheese mixed together in equal portions OR a very thick, drained yogurt (drain a very good, non sour yogurt in a colander through several layers of paper towel until it has thickened to a near cream cheese like consistency). Thank you; I’m going to modify the post and include that information; much appreciated. 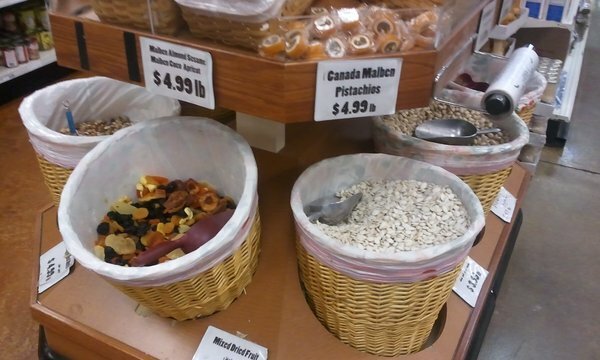 First off, I love ethnic markets! They always have the most interesting ingredients, and amazing prices. We have a new Indian market here and I wandered in the other day – unbelievable! Second, loving the goaterie thing. I was just reminiscing yesterday about when my Jamaican roommate in college cooked up some curried goat for us. So good. Count me in! I’m just a bit perturbed at myself for not seeking them out sooner. It seems this one stretch of road not that far from me has several…so it’s been a weekly excursion. Have yet to hit the Russian and Greek markets…but will be very soon. Glad to have you joining us! Your dish is to die for! I am drooling. Middle Eastern cuisine is so fabulous. I really have to cook with goat. That is a meat I have only eaten once, in Greece. Then you must join the challenge! I’ve never had goat so will be interesting for all of us!